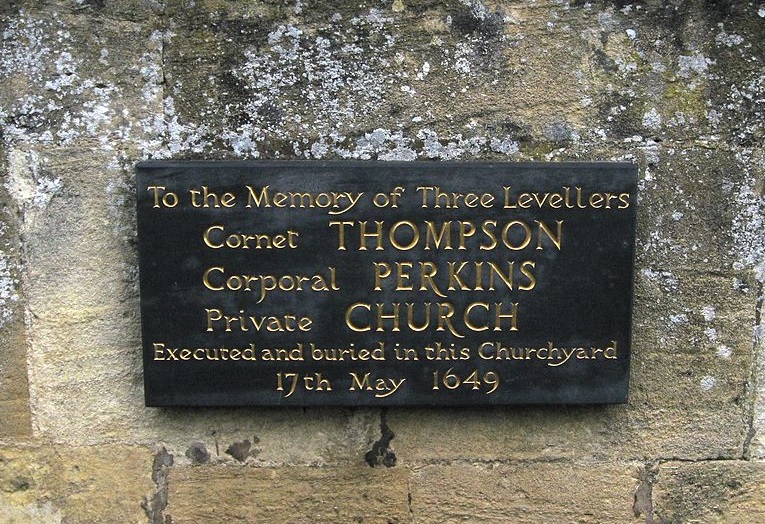 On this date in 1649, Oliver Cromwell had three leaders of his army’s working-class Levellers movement shot against the walls of Burford church. The revolutionary army with which Cromwell had overthrown King Charles I came to a crisis in 1649 as the interests of senior officers and the class of landowners and merchants they hailed from clashed against those of the common soldiery. This democratic and class-conscious Leveller movement has invited the sympathy of later radicals, and it would be hard to flatly call that attention anachronistic; Leveller William Walyn even anticipated Marx’s language in dismissing the Magna Carta as “that mess of pottage.”* This is an England whose capitalist shape is coming clearly into view. Flint struck steel when the army’s Grandees laid a nasty Sophie’s choice on troops whose pay was deep in arrears: leave the army (forfeiting the back pay) or leave the country (to invade Ireland). Both options redounded to the advantage of the state and its moneyed interests, at the expense of the lower orders. Army mutinies commenced immediately and the massive London procession that carried the executed Leveller Robert Lockyer to his grave proved the depth and danger of the public sentiment. the whole fabric of the Commonwealth fell into the grossest and vilest tyranny that ever Englishmen groaned under … which, with the considerations of the particular, most insufferable abuses and dissatisfactions put upon us, moved us to an unanimous refusal to go … till full satisfaction and security was given to us as Soldiers and Commoners, by a Council of our own free election. Cromwell had a different satisfaction in mind. 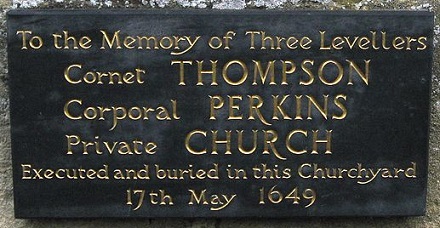 Aided by an envoy sent to stall the rebels with a diversionary negotiation, Cromwell and Thomas Fairfax were able to surprise the 1,500 Levellers camped at Burford with a midnight attack the night of May 13-14. By morning, 340 soldiers were locked in Burford’s church as prisoners. The tragic denouement of this Banbury mutiny was the execution of three soldiers, Cornet Thompson, Corporal Perkins, and Private Church. A plaque at the site still commemorates the event. (cc) image from Kaihsu Tai. On month’s end, Cromwell was certifying to Parliament that mutinous Levellers had all been pacified … and come August, he was ravaging Ireland as planned. * The Biblical allusion was current in the culture; Cromwell invoked the same phrase a few years later when he dismissed the Rump Parliament.